You don’t get the opportunity to hear your favourite epilepsy researchers come together and speak about their ground breaking work. It’s even rarer to be invited to join them and present some of your own work. 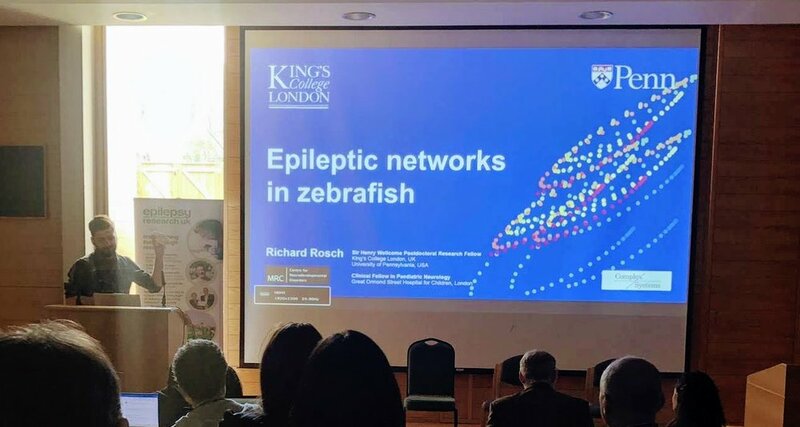 It has been a real pleasure to be able to present some first data from our zebrafish model of epileptic seizure at the ERUK Expert Workshop on Epilepsy and Neurodevelopmental Disorders. This was a first opportunity to show some of our single-cell resolution data from the newer fish lines, and I think it went down well! Looking forward to many more workshops in the future! January is always a busy time of the year - everyone is coming back from holiday-hibernation, and then there are the yearly Young Epilepsy Research Retreat from the UCL Epilepsy Research teams, closely followed by the BPNA Annual Conference. I particularly enjoyed the opportunity this year to take some work back to the conference, that could have only happened because I was introduced to the right collaborator at this very conference a few years back. Thanks again to Ming Lim for making the introduction to Sukhvir Wright - brilliant child neurologist and neuroscientist looking into autoimmune causes of epilepsy. This chance(ish) meeting has spawned the work that has only recently come out in our PNAS paper. Here is me talking to a room full of child neurologists about our finding in regards to cortical dynamics in mice and in kids under NMDAR-Ab exposure. It’s been a great pleasure presenting some of our work at Aston University in Birmingham, and catch up with long-term collaborators there. There’s some exciting research on epilepsy in different animal models coming out of Aston, and I’m looking forward to some of their new work coming out in print soon! After having heard lots and lots of talk about this conference at various epilepsy-related gatherings last year, I decided to bite the bullet and sign up for the Gordon Research Conference and Seminar on Mechanisms of Epilepsy and Neural Synchronization. The speakers look like a great mix of theoretical neuroscientists, clinician-scientists and experimental neurobiologists. Plus it's set in glorious Vermont, the land of cheese and maple syrup. P.S. Turns out I've been invited to give a short presentation on our modelling work on the intracranial EEG recordings for our epilepsy surgery patients. Last year, the Wellcome Trust Centre for Neuroimaging became the Wellcome Centre for Human Neuroimaging - to distinguish it from the brand-spanking-new Wellcome Centre for Integrative Neuroimaging in Oxford. But instead of just funding two competitors, the Wellcome Trust wants more bang for their buck and decided to get everyone together to share what we are working on - hopefully paving the way for future collaborations. As part of this, I was offered the opportunity to talk a little bit about my work on using computational models to link EEG recordings in patients with NMDA-receptors, and a corresponding mouse model. It's perhaps fitting that this will be my last talk given with full Wellcome Trust Centre affiliation, before heading over to King's. As always it’s a pleasure to contribute to this year’s SPM course. It’s an opportunity to learn about MEG / EEG analysis, DCMs in all variety and watch me try and demonstrate how to do group analyses on the point and click interface (hint: it’s much easier to do this in code once you get hang of it!). There’s still places available for free for UCL students, so come along if you’re keen! Some colleagues from Imperial have organised a great looking workshop, bringing together neuroscientists and mathematicians to talk about networks, models and dynamical systems. I'll be at the workshop talking about some of our work on NMDA receptor encephalitis and networks in epilepsy surgery.